Connecting All Strands mathematics from Caxton Educational NZ. I would add that, in my observations, during 15 years’ experience of curriculum development, rich mathematical tasks often incorporate several strands of the curriculum with cohesive connections for students to wrap their heads around and really dig into. Let’s analyse one of my favourite rich tasks, “Cubes in cubes,” from the Connecting All Strands series by Caxton Education to show how this task might fulfil the criteria above. 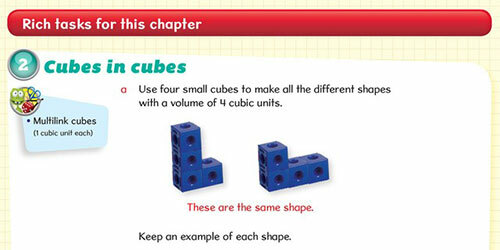 The task prompts students to use four multilink cubes to make all the different shapes with a volume of 4 cubic units. On the surface, this deceptively simple activity covers the concept of volume in the strand of geometry in the NZ Curriculum. Of course, it also uses measurement. This task is cognitively demanding because students need to create a number of shapes, are limited on the number of blocks they can use, must manipulate the cubes to ensure that shapes are not the same in different orientations, and be certain that they have found all the possible shapes. Students need tactile opportunities of manipulating materials to support their problem-solving abilities. Teachers have shared that they ask students to draw their shapes to reinforce understanding of three-dimensionality and perspective. Drawing or representing concepts aids also assists students to transition their understanding from concrete materials to abstract ideas. In my workshops, each multilevel group receives a bag of 32 cubes to encourage them to consider groupings algebraically (How many groups of 4 can you make with 32 cubes?). Next I extend the activity by asking students to chart how many groups found each shape, or how they might calculate the percentage of groups who found all eight shapes, so now the activity has incorporated statistics. Finally, students are allowed sufficient time to grapple with the process. I provide ample time for groups to collaborate, explore, and discuss the different paths they followed to come up with their solutions. I promote students’ conversations and encourage discussions by asking leading questions. For instance, what does the picture say under the directions for the task? “These are the same shape.” In that moment, students can be guided to discuss and justify what it means to be the “same.” Are they talking about rotation, another geometric concept? Quite possibly! In this rich task, students use their conceptual understanding to show comprehension of the mathematical concepts that the teacher has elaborated on, including volume, measurement, and rotation, operations involving division/multiplication strategies, relationships involving percentage, and collecting and displaying data. In addition, students show strategic competence to represent and solve variations of cubic units and adaptive reasoning to justify their solutions. Easy, right? A rich task appears quite simple at first glance, but incorporates so much more! If you are trying to ramp up your instruction with more high-quality tasks, see the Connecting All Strands series for Years 3-8.